Windmills. One of the first things you think of whenever you hear the words “Holland” or “The Netherlands.” The stereotype is true – you’ll be pleased to know that there is no shortage of these iconic buildings in the Netherlands and for many places, it’s the literal gem of the area. Of course, the Netherlands is more than just windmills, but it’s still a great excuse for a visit. 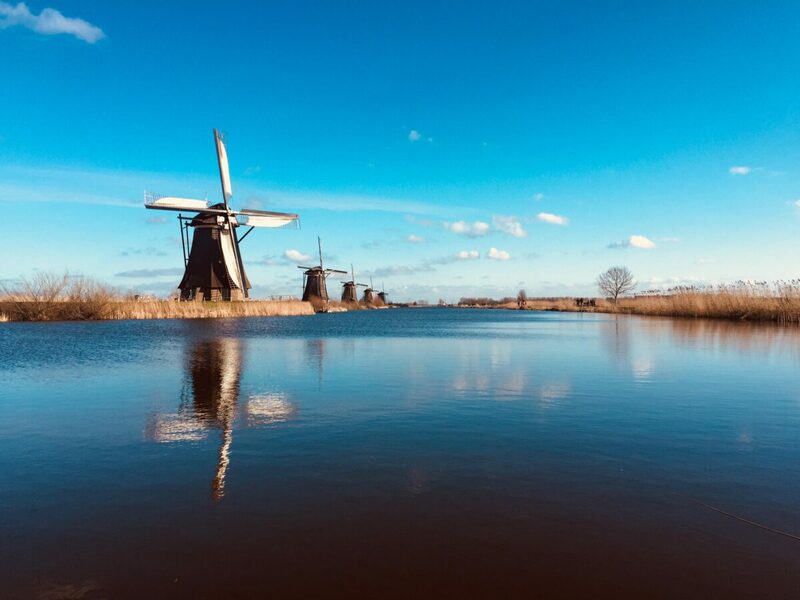 So if you’re living in the Netherlands and fancy a windmill trip, or if you’re doting on Dutch life and are coming to visit, then don’t forget to check these out! 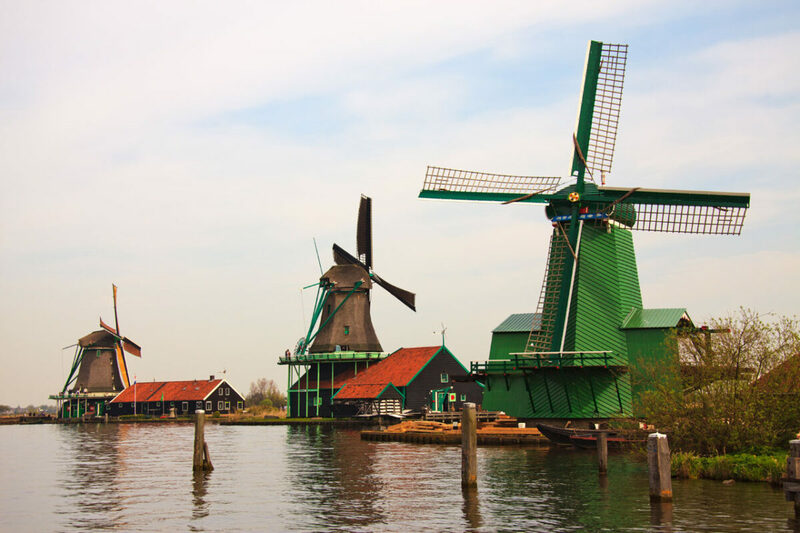 Here are 7 great windmills to visit in the Netherlands. Kinderdijk isn’t just one windmill, but a whole windmill park. 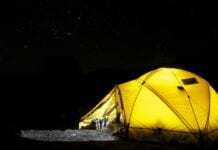 It’s located in South Holland and if you’re a tourist, there are many tour companies that drive there to give you a tour. The windmills are actually still lived in, so don’t be surprised to see someone’s underwear hanging up outside. Kinderdijk not only has all of its windmills, but also a small museum, a cafe and shop. You can also do a boat tour taking you alongside the windmills. You take a walk or a bike ride around Kinderdijk. In short, the place is just beautiful. I’m lucky enough to get snaps like these living 20 mins away! Zaanse Schans is similar to Kinderdijk in the sense that it’s a windmill park, but Zaanse Schans is by far the most popular of the two. There are plenty of things to do there too, you can actually go inside many of the windmills and some are museums and shops. 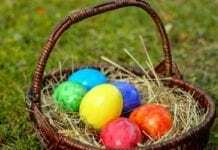 Take a bike ride around the area, take a walking tour or explore some of the local shops. It’s also easy to reach Zaanse Schans from Amsterdam. Tip: Avoid peak times in the summer, it gets very busy due to all of the tourists, so if you live nearby, go more off-peak – in clock form and in time of year too! If there’s no shortage of one thing, that’s the windmills here fo’ sure. 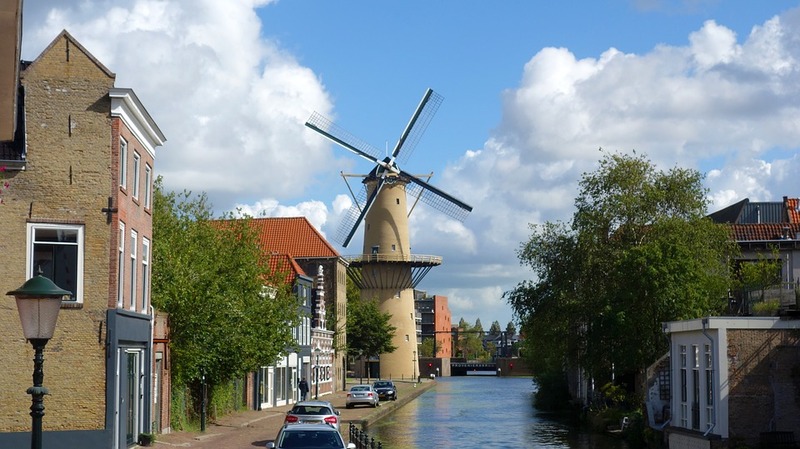 Molen de Valk is found in the beautiful Leiden, the home of DutchReview. It’s been there since the start of the 17th century, so it’s certainly one of Leiden’s pride and joys. I have to walk past it every time I go to the DR office and it dominates the area. The mill was originally used for grain and now it’s a little museum. Don’t forget to visit Leiden (it’s beautiful!) and take a visit to the windmill. Great for your Instagram and it’s a great place to be in general. If you’re after impressive windmills, then Schiedam is your place. Schiedam is home to some of the largest windmills in the whole world. The purpose of these huge windmills was to grind grain, as they used this to produce Jenever – making it a famous city in terms of producing Jenever. You can learn all about this inside one of the windmills (De Neiuwe Palmboom), which has been transformed into a museum. Here you can see only 6 of the original 20 windmills of Schiedam. You’ll find Schiedam right next to Rotterdam – so pop by! 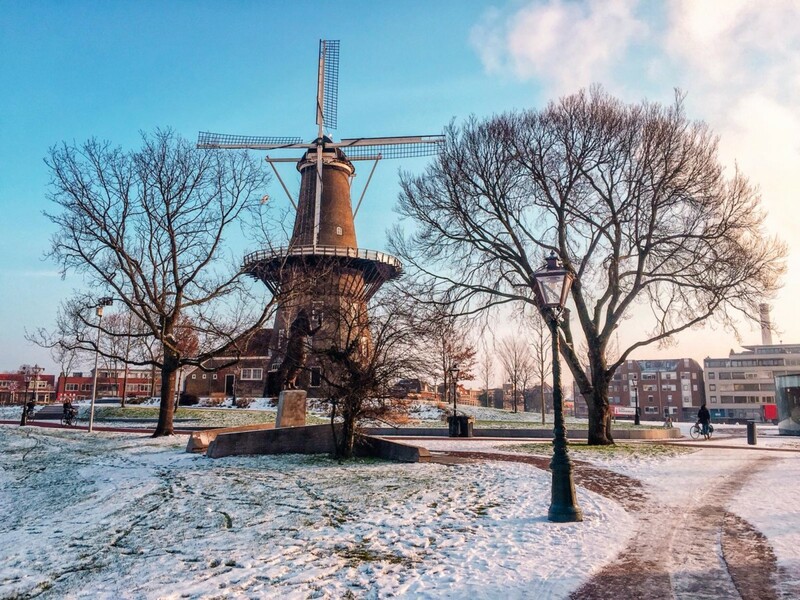 Haarlem is another beautiful city sporting an iconic windmill. The windmill has been around since the 18th century but was completely destroyed in a storm in the 1930s. It was later rebuilt and made into a museum which tells you about the Netherlands and windmills and how these transformed the country. 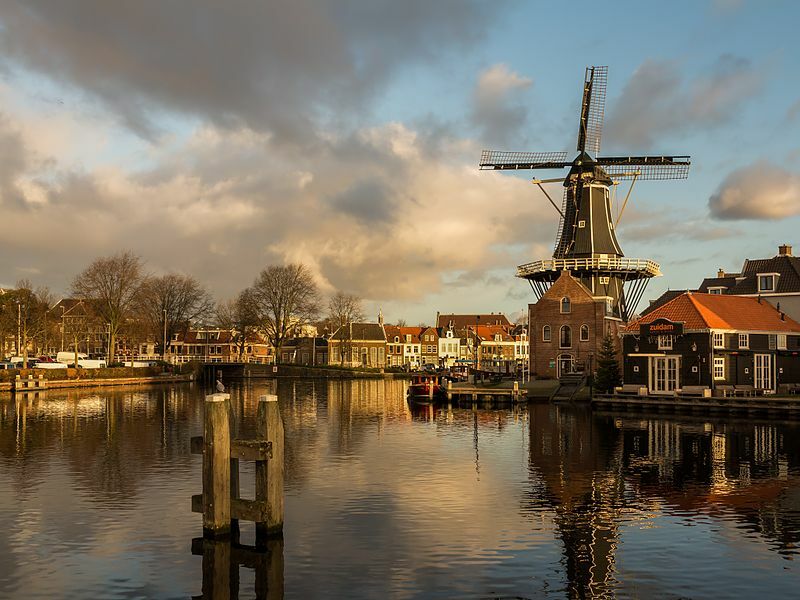 Not only is the windmill great to visit, but Haarlem itself is beautiful and is well worth a visit. So if you haven’t been there already – it’s not too far from Amsterdam (if you’re a tourist), so go! Looking for windmills in Amsterdam? 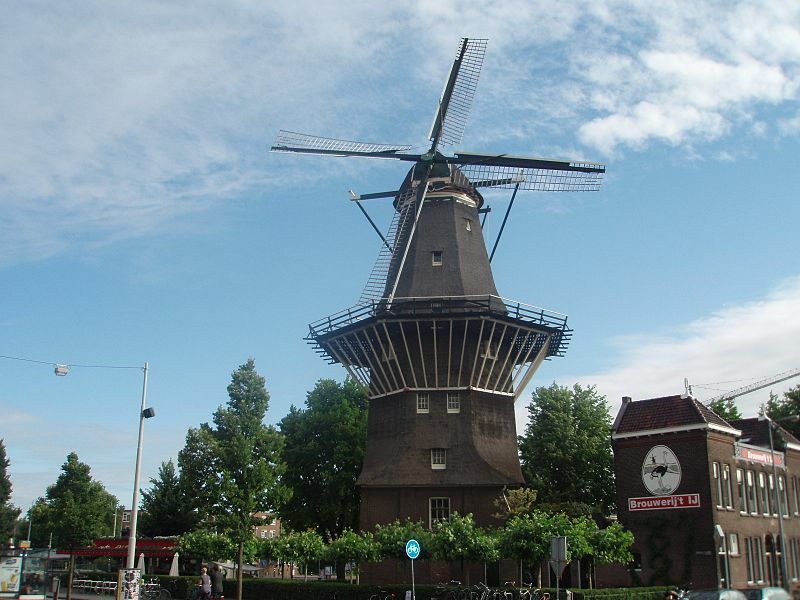 Here you can find De Gooyer, which is one of Amsterdam’s most famous windmills. It was built in the early 16th century, so it’s certainly old. It’s not in the place where it was first built, as it has been moved around Amsterdam. You’ll find the windmill turning on the first Saturday of the month, so it’s the perfect time to see it in action while on your Saturday morning walk. De Dikkert is an old sawmill, which used to be in Zaandam. 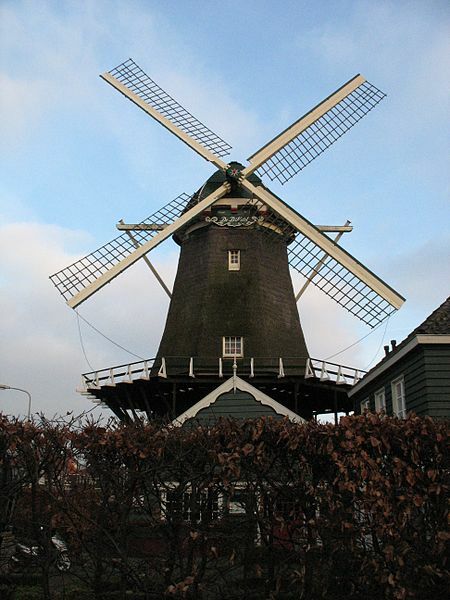 However, now it’s now a corn mill and is found in Amstelveen. It is now restored. Therefore, again, if you’re around the Amsterdam area, then it’s the perfect place to visit. What makes it unique is that it is a restaurant too – so if you’re ever want to say you’ve eaten in an old windmill in Holland, then here’s your chance! A perfect time to visit the windmills is on National Mill Day in May every year. On this day you can enter hundreds of different windmills FOR FREE! Also, it’s the day to witness all the windmills turning, so it’s certainly a unique day in the Netherlands and the perfect day to see all of the windmills for yourself (if only you get around them all that is). Thank you for your lovely article on dutch windmills. I can tell you haven’t been to Schiedam the past year because there are some errors in that part. I gladly help you out on that! The windmills of Schiedam are thé highest in the world. Top of the roof is about 33 meters above the ground which equals a building with 11 floors. The museum has moved just over a year ago from windmill De Nieuwe Palmboom (The New Palmtree) to windmill De Walvisch (The Whale). That mill also houses a wonderful millshop where you can by all kinds of baking products and flour varieties produced on windmill De Vrijheid (The Freedom), another mill of Schiedam. The one on the picture is windmill De Kameel (the Camel); with 30 meters the little brother of the other Schiedam windmills.